Homeopathy is a natural approach to healing, the principles of which were first formulated at the end of the 18th century by a German physician, Samuel Hahnemann. The fundamental principle of homeopathy is that a body's symptoms represent its best efforts to heal disease and illness. Homeopathy works with your symptoms to help cure illness rather than suppressing it. It seeks to take advantage of the body's recuperative powers which, when functioning well, will heal disease. What is the scope of homeopathy? What conditions benefit from it? Recurrent subtle symptoms: low energy, poor sleep, sore throat, etc. Genetic disorders: homeopathy cannot cure genetic problems, but it may reduce the severity of how the disease's complications manifest in the body. Does Dr. Breunig practice classical homeopathy? Yes. 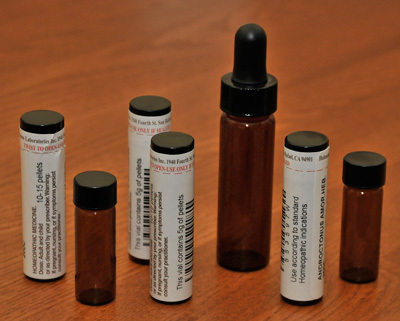 I recommend only one homeopathic remedy at a time and wait to see how your body responds. What happens on my first visit with Dr. Breunig? The first visit is a two-hour appointment. Besides the physical examination, our visit will include an extensive consultation. I will listen, observe, and ask occasional questions. You will discuss the condition that has caused you to seek treatment. The more specific and detailed you can be, the better. My goal is to figure out how your condition is unique to you and different from anyone else's. I want to know the location of your physical complaint(s), the sensation or character of the pain, factors that make it better or worse, other symptoms that regularly occur in association with your problem, and the onset of the problem. I will also consider your energy level, diet, sleep, mental well being (memory, clarity of thought, etc. ), and emotional health (expression of emotions, patterns that limit you). What happens next? What about follow-up visits? After the first visit, I will recommend a treatment plan for you, with suggestions for spinal care, homeopathic remedy recommendation and any other suggestions appropriate for your condition. For chronic conditions, I will evaluate the action of the homeopathic remedy and your response to it approximately every 5-6 weeks. However, if your condition is acute, we would follow up in a matter of days, not weeks. Follow-up appointments are 25 minutes. Where can I read more about homeopathy? Dooley, Timothy, ND, MD. Homeopathy: Beyond Flat Earth Medicine, Timing Publications, San Diego, California (1995). Lansky, Amy L., PhD. Impossible Cure: The Promise of Homeopathy. R.L. Ranch Press, Portola Valley, California (2003). Ullman, Dana. The Consumer's Guide of Homeopathy. J. P. Tarcher / Putnam, New York, New York (1995). Ullman, Robert, ND and Reichenberg-Ullman, Judyth, ND. Homeopathic Self-Care: The Quick & Easy Guide for the Whole Family. Prima Publishing, Rocklin, California (1997). "My family and I have been seeing Dr. Breunig for about 1-1/2 years. Her homeopathic care has enabled me to resolve my allergies and chronic cough without the use of steroids and antihistamines. She has also resolved chronic back pain that I had not been able to reduce through other chiropractors and physical therapy clinics. I feel healthier than ever. Also, my daughters, 11 and 14, have eliminated the need for antihistamines to manage their allergies under Dr. Breunig's care."